Mar. 30, 2019 – Superheroes, classic villains, and anime characters congregated in the Library foyer and atrium for the fourth annual Regent Con. The event featured several cosplay contests, a live DJ, and over 20 vendors, who were offering everything from henna to lessons in lightsaber dueling. Attendees also had the chance to try out a video game that had been designed and produced by students in one of Regent’s animation classes. Sophomore Esmeralda Lopez had gone to the Library to study and was surprised to find the building buzzing with costumed students. It was not the quiet that she had been expecting, but she enjoyed the event, especially the food truck. “It was cool; the food is good” Lopez said while eating outside with friends. “I love Regent Con, and I am so glad for the opportunity to come and cosplay,” said Sierra Torrance, a sophomore history major who came dressed as Thor. She had originally made the costume last year for the event Regent Goes to Town: Infinity War event. The lightsaber dueling lessons were a big hit with attendees. Throughout the eight hour event, a continuous stream of novice Jedis (and Sith) dueled with each other on the Library plaza. The event also offered several workshops, one of which gave cosplay enthusiasts the chance to hear from anime voice actor Caitlin Glass. Attendees also had the chance to meet-and-greet or sit in on a Q&A session with Glass. This was the first time that Regent Con was held in the Library. Previously, the event had been held in Robertson Hall. The relocation to the Library gave vendors more space, and allowed the Regent Con organizers to utilize the atrium area. 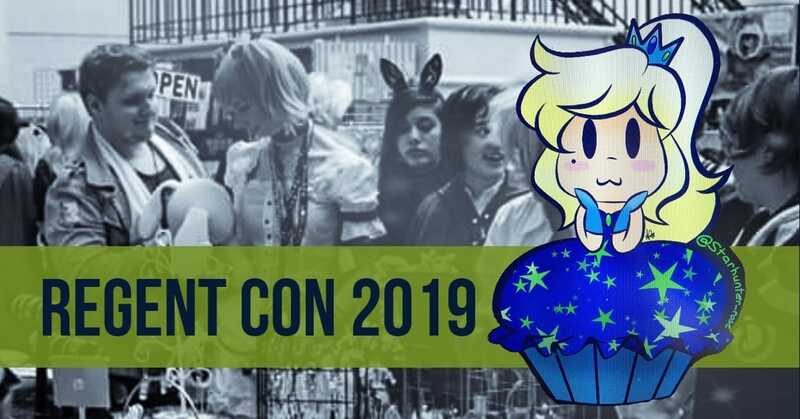 Regent Con is an opportunity for both serious cosplayers and those new to the hobby to dress up and meet like-minded people while browsing diverse vendors and learning more about the cosplay world. The event was well attended this year, and its success has ensured that Regent Con will be back again next spring. Julie Taylor is a staff writer for the Daily Runner.